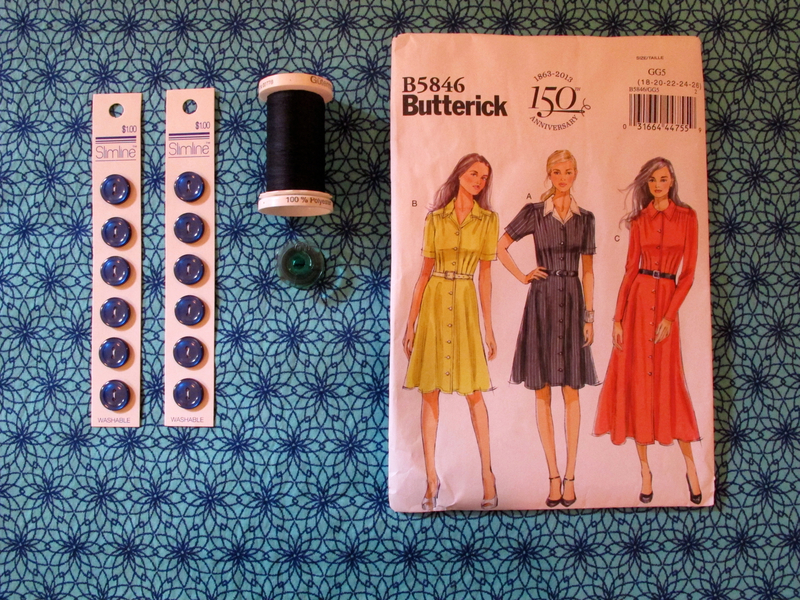 Good, ol’ shirtdresses are making a comeback at the pattern companies, so one of them will be my next project. Next up is View B, the version with short sleeves and the shorter skirt. Butterick 5846 is rather new. Online and in the catalog, the photo of the actual sample garment is shown with vintage styling. Accessories can take it either way. I plan to do a matching belt with a vintage slide buckle. Of course, the advantage of a dress pattern with a wide skirt is I don’t have to fit anything below the waist. The finished garment measurements on the pattern indicate there is plenty of ease at the bust, but I’ll still need to make changes: lower the bust point, add length to the front, subtract length at the side with a dart. I’m getting better at full bust adjustments, but I still intend to muslin the bodice. The fabric is a cotton lawn from JoAnn’s. Isn’t it pretty? JoAnn’s seems to have a better selection of apparel fabric these days. I can’t go in for a notion without finding something I want to get a few yards of. Recent scores have included a coral patterned cotton lawn, a blue and pink madras plaid, and a couple of linen/cotton blends. Consequently, my stash is growing nicely. I have enough to make five or six dresses and have already matched up each fabric with a pattern. I had been planning to do a series of vintage separates, but I am loving the idea of dresses right now. They are versatile during Northern California’s spring, summer and fall, when we have warm to hot days with cooler nights. With a natural-fiber dress, you just need a cardigan to have all your bases covered. I washed several lengths of fabric on Sunday and traced off my pattern in Swedish tracing paper. So this project is under way. Next up is the pattern alteration and the muslin. Love it! Can’t wait to see the finished product!! Oh, the pressure is on now! Thanks for stopping by, Marcy. The fabric is gorgeous! Can’t wait to see it finished. Thanks, Deb! I hope to make a lot of progress this three-day weekend. Off to the sewing area!